There’s a midpoint in a franchise where a game diversifies from the traditional style currently employed from day one of the franchise all of a sudden isn’t good enough, and it needs a change. This point is crucial in a franchises’ existance, as it goes from being a good series of games to either a great, all time classic series of games to one which filters out into nothing. One such game is Sonic Spinball. Released between Sonic 2 and Sonic 3, Sonic Spinball was a radical departure from the Sonic series, that borrowed from elements from the first two games – namely Spring Yard Zone and Casino World from Sonic 1 and 2 respectively. 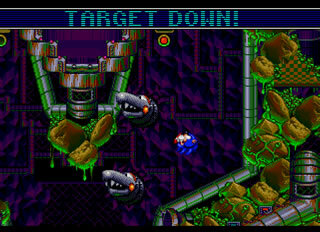 The game uses the “pinball” features from those sections, and expands it into a full game. There is a weak story behind it, Dr. Robotnik has taken control of a mountain, and has constructed an elaborate “Pinball Defense System” to keep Sonic from destroying his plans to take over the world. Sonic – who is not adverse from curling up into a ball and attacking things, does so once again to defeat Robotnik. Well that’s the story, what’s the game like. First of all, those of you who are expecting a proper pinball simulation may be a little disappointed. Sonic for 90% of the time is curled into a ball, but it’s not a physically accurate pinball game. For one sonic can run, move about and even do some platform sections. Therefore, those expecting a purist pinball game should be warned. However, I would still play it, as it’s a remarkably fun game. Of course, you had enemies to destroy, but they were pretty easy to beat. 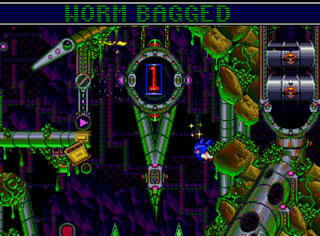 The game takes place on 3 pinball sized worlds, where the object is to go into the worlds, retrieve the chaos emeralds, then defeat a boss at the end of the game. The levels involve hitting targets to complete fairly simple puzzles (and even if you’re clueless, a big flashy banner along the top of the screen resembling the dot matrix will tell you what you need to do), to eventually get your hands on the chaos emeralds. Letting a ball drop into the water (hey, I thought sonic could swim? ), toxic waste or lava at the bottom of the screen results in you losing a life. Lose 3 lives and it’s game over. And that’s it. It’s actually a pretty tough game, the fact there’s no continues when you begin, and there’s no way to get some more (unlike other Sonic games). Also, you die fairly regularly in this game, as the flippers aren’t quite as big as traditional pinball. Nevertheless, this is a rather fun diversion from the Sonic genre. At the time it was well recieved as an awesome game. I wouldn’t go that far, it’s fun, and well worth picking up for cheap as a retro-er. However it’s not as good as the classic sonic games, largely due to the difficulty, but also because pinball isn’t one of those games that transfers well to a videogame. However, if you’ve got an afternoon to spare, and you fancy a nice little Sonic game, you can’t go much worse than this.